Fixodrive® FX 50 – the quick and easy-to-install protection and drainage sheet for pathways and driveways. 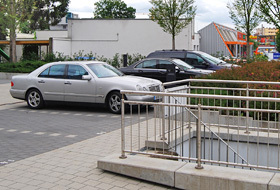 Cost-effect solution for roofs: Driveways and pathways installed over Fixodrive® FX 50. Are you looking for a cost-effective way of installing pathways and driveways on roofs? Low material costs and efficient installation are important, particularly with a large area. ZinCo has now developed Fixodrive® FX 50, a protection and drainage mat designed specifically for this type of application and to our usual high standard. Fixodrive® consists of thermoformed polypropylene with proven drainage capacity, in accordance with the requirements of DIN EN ISO 12958. The rolls of Fixodrive® are quickly installed, as they have a pre-attached filter sheet and they overlap along one side. The individual rolls can be firmly attached to each other thanks to the interlocking studs along the longitudinal side. 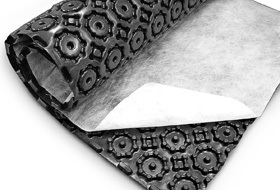 Once the Fixodrive® mats are installed, the underlying roof waterproof membrane is perfectly protected as Fixodrive® can easily withstand a compressive load of about 500 kN/m². Given this compressive strength, you can also drive on the roof at an advanced stage of the building project, for example when using a construction vehicle to apply a layer of gravel. The surface covering can consist of paving slabs, concrete or natural stone tiles. Fixodrive® ensures its safe and cost-effective subsequent use for pathways and driveways, as access for deliveries or for emergency vehicles. Fixodrive® can be installed with a combination of surface types and greened areas and can be used on flat roofs and pitched roofs and on both cold and warm roofs.